This photograph was taken on the morning of a beautiful bride’s wedding just before she put on her wedding gown. In just a short while there would be "The Reveal" when her groom would see her for the first time in her dress. Afterwards we would take amazing wedding pictures at The deSeversky Mansion and Conference Center where the awesome celebration would take place. 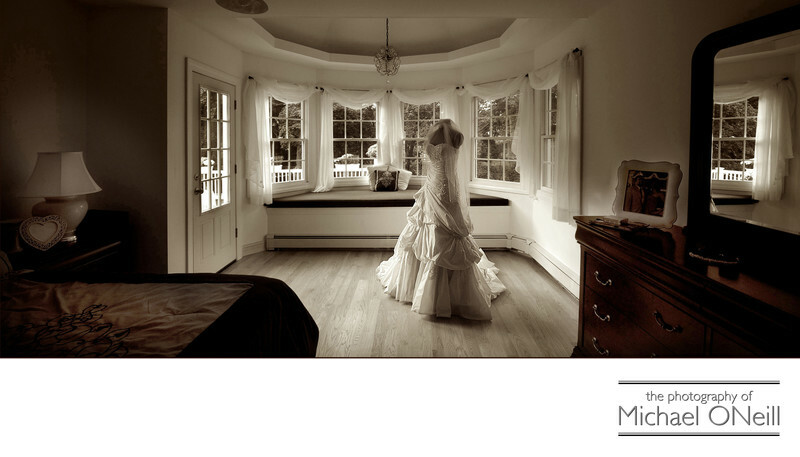 I love shooting at deSeversky...one of the most elegant of Long Island catering venues. Documenting all of the details that make up the theme or feeling surrounding your wedding is one of the most rewarding aspects of my craft. Every picture should tell a story and this one spoke volumes to the bride and her family. It seems that every photographer these days is taking a picture of the bride’s wedding gown before she gets dressed. I’ve seen gowns simply hanging from curtain rods, draped over the back of a door, or even brought outside and suspended from a balcony or the limbs of a tree. Most of these shots are the product of the photographer’s creative mind but do little to tell the story of the day. So what makes this shot so special? The room. You see the bride’s father was a building contractor and he had just built an addition on the house that the bride grew up in. This masterpiece of a bedroom was where the bride was getting dressed on her special day. It seems her father finished work on the room the night before the wedding. Talk about pressure! What a wonderful gift for his daughter. To this day I remember the look on her father’s face when he saw his little girl in her wedding gown for the first time. It wasn’t the location that made this photograph so special. It was the story behind the location, and all of the loving emotions that were captured therein. Get in touch with me to discuss letting me tell the story of your wedding day.